Toshiba Europe were kind enough to give us some time with their new Windows 8 Ultrabooks. 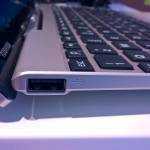 You may have read about the new models here on Ultrabooknews but this time we’ve had the chance to get hands-on. 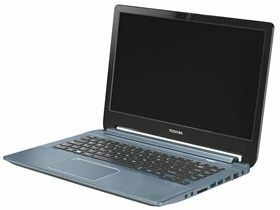 The Toshiba Satellite U840 is the entry-level Windows 8 Ultrabook and the Satellite U920t the high-end slider + touch convertible. Toshiba Satellite U940 and Toshiba Satellite U920t. Hands-on Videos below. We’ve had hands-on with the U920t slider before so we’ll leave that for the moment and focus on the Toshiba Satellite U940 which says a lot about the way the Ultrabook market is expanding both up and down. 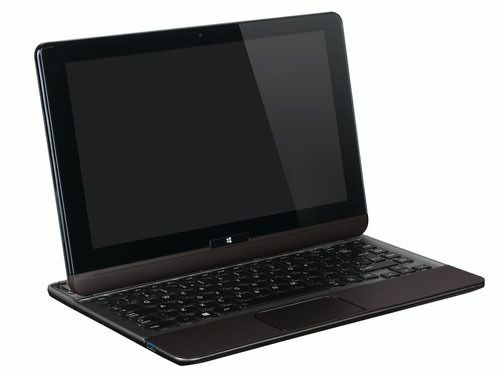 The U940 will displace the U840 entry-level Ultrabook which has only been on the market for a short while. Why? After having hands-on we have one thought, price. The U940 is a step down in quality from the U840 and is clearly being built to a price. A slightly cheap plastic finish isn’t a problem for this target market if it ends up at the pricing we think it’s going to end up. Today the U845 (the US version of the U840) is being offered for $599 which isn’t a bad deal at all. We expect the U940 to go in at slightly above that level but with enough headroom to be offered at $599 or below for Christmas. Manufacturers have to try everything in Q4 and this, we feel, is Toshiba’s attempt at the low-cost sector. 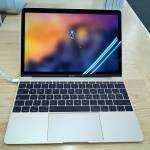 If it’s passes early reviews well it could be a big seller too because you’ve got a backlit keyboard, removable 54Wh battery and access panels for memory and HDD. The SSD is a separate on-board module, combined with the HDD by Intel’s Smart Response software. The port selection is OK and as a 14” mainstream laptop, it’s going to offer something a little more than the HDD-based devices out there. 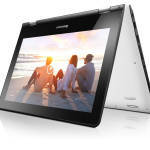 The U940 will be available in Germany after Windows 8 launch in October in two versions. A Core i3 with 4GB will sit at entry-level with the Core i5 8GB version coming in above that. There won’t be a discreet graphics version of this in Germany as there will be in other parts of the world. Full pricing can not be given by Toshiba until Windows 8 launches. 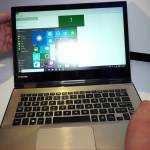 The Toshiba U920t is a completely different beast although it must be mentioned that the processing power in a Core i5 U920t at 1200 Euros isn’t going to be any better than the U940 at 600 Euro. What you’re getting is a convertible design with multi-touch IPS screen, Intel’s sensor pack (GPS, Accelerometer, Ambient Light, e-compass) and in some models (not in Germany initially) NFC. Perhaps the most significant difference in performance will be down to the fast SSD (as per the Toshiba Z930) of up to 256GB. The final SKUs and pricing will be announced on 25th October but the target price here is 1200 Euros which is likely to be a Core i3 model with 128Gb SSD. 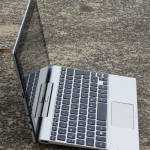 We’d be interested to hear your thoughts on these two examples of the Ultrabook by Toshiba. We’re guessing that while the U940 may not represent what many of us want in a thin and powerful laptop, it is going to get a more positive response than the U920t which, although it’s a smart design, we’re struggling to come to terms with on price and tablet usability.